Such community-based projects—art for, by, and about black people—were often formulated in purposive opposition to the official narratives of civic pride and the modernist public sculptures in steel epitomized by the Chicago Picasso (erected downtown in 1967 just months before the Wall of Respect). That these mural programs have been destroyed or removed from their original sites reminds us of the particular challenges in maintaining artwork that is imbricated in a built environment subject to the cycles of urban devaluation and renewal. In contrast to the boosterism that heralded the arrival of the Chicago Picasso, these exhibitions signal another Chicago, where disinvestment and demolition affect black, brown, and working-class neighborhoods and communities on the South and West Sides. Preservation has proven elusive for many public murals from this era, and these exhibitions are part of recent efforts to document and historicize the legacy of socially engaged art in Chicago, as in the recent Chicago Social Practice History Series. However, these exhibitions move beyond simple historiographic restitution by demonstrating how the “art for the people” ethos of the Black Arts Movement anticipated and informed more populist visions of public art that we have come to label today as social practice. Taken together, these exhibitions represent an initial attempt to realign our genealogies of public and social practice art, all the while reminding us that assimilating such freighted projects into a historiography of twentieth-century art that has largely rendered it illegible is untenable at times. While many South Side residents have long celebrated the Wall of Respect, its legacy is not widely known outside local or academic circles. OBAC’s three workshops—Visual Arts, Writer’s, and Community—were part of a cluster of cultural activities culminating in Chicago in the late 1960s that broadly constituted the city’s Black Arts Movement. The Visual Arts Workshop was coordinated by painter Jeff Donaldson, who worked in tandem with muralist William Walker to lead the Wall of Respect project. Fourteen artists contributed to the eight sections of the mural that herald black heroes in the realms of Rhythm and Blues, Jazz, Theater, Statesmen, Religion, Literature, Dance, and Sports. However, the Wall was more than the sum of its parts. While the Black Arts Movement in Chicago has largely been credited with building enduring institutions, including the Association for the Advancement of Creative Musicians and Third World Press, the Wall of Respect was instead an ephemeral and unsanctioned object-turned-event that galvanized so much support and attention that city officials and police understood (or, more appropriately, feared) it to be a flashpoint for Black Power politics in Chicago2 During the brief but powerful existence of the mural (the building caught fire and was later demolished in 1972), the artists, along with community members and other cultural producers allied to OBAC, activated the corner of Forty-Third Street and Langley Avenue with painting, musical and theatrical performances, poetry readings, Black Power rallies, and spontaneous gatherings that reflected the rich street life of the South Side. The curators derived the exhibition from research conducted for a book project entitled The Wall of Respect: Public Art and Black Liberation in 1960s Chicago, which was released after the exhibition closed.3 I am a contributor to the book; however, I was not involved with the planning of the exhibition. Like the book, the exhibition presents primary documents, photographs, media coverage, and poetic responses that narrate the mural and its reception as an art object and social space. The exhibition activates these archival materials by inviting responses to the Wall in ways that suggest such artistic solidarities are still relevant today. Original OBAC documents—displayed in vitrines or as enlarged reproductions—provide a rare glimpse into the organization itself. They are impassioned manifestos typed on official letterhead, outlining the declarations of a radical group of artists seeking to put art to work in the struggle for black liberation. Some documents show handwritten notes, such as a working list of heroes, where Marcus Garvey is noted as “a man whose vision is still relevant” and Billie Holiday is “all pain and suffering, joined with beauty & strength.” OBAC’s carefully outlined program indicates that their revolution would not be a spontaneous event. Its bureaucratic structures and intellectual pronouncements were tempered at the street level when the artists went to work to paint the mural among the people, climbing up and down the scaffolding as neighbors came out to share their thoughts on its progress. Exhibiting archival materials in the spacious galleries of the Chicago Cultural Center is a tricky proposition, and at times it feels empty. However, the curators attempt to animate the documents and their guiding philosophies by including two works by Chicago artist Norman Teague in homage to OBAC and the Wall. One of the works, Paper Stand, 2017, is a reconstruction of the newspaper stand where Carolyn Lawrence originally painted the Dance section. Here the surface is a blank slate that visitors are invited to mark up in chalk. An accumulation of words and drawings, rubbed out and rewritten by visitors, cover the surface, indicating the ways that the Wall—as a model for participatory artistic practice—is an open proposal, even if OBAC’s closed ranks strained against revisions of the original project (fig. 1). Figure 1. Installation view of Norman Teague, Paper Stand, 2017, wood, paint, tar paper (left) and Bob Crawford, The Wall of Respect, late 1967, photomural, courtesy of Bob Crawford Estate (right). Photograph courtesy of the author. Because the mural itself no longer exists, it is unsurprising that the exhibition relies heavily on photographs to depict the Wall and the various activities that occurred there. Photographers Robert Abbott “Bobby” Sengstacke, Darryl Cowherd, Roy Lewis, and Bob Crawford astutely capture its planning and production, as well as the gatherings, performances, and daily onlookers. The photographs are either enlarged and mounted on foamcore, or matted and framed as fine art prints (fig. 2). Presented in both forms, they slip between exhibition didactic and art object. This slippage points to the question of how to best represent the work of collectives (the planning, negotiating, producing) and art objects that exceed their materiality and become social spaces that are then shaped by participants. There is a need to document and narrate what happened, who was there—and photography has become central to documenting ephemeral, participatory, and performance art practices, among others. But the photographers who came to the Wall also created images that resisted factual reportage. Photography has been an ethnographic tool used by academics and documentarians alike to render residents of the “black ghetto” as visible objects of study. The framed photographs are printed on paper with more visual richness in their detail and tonality than the enlarged, mounted photographs. It is here that the street scene around the Wall comes more into focus as a space for the appearance of a complex black subject. Figures lean and pose against scraped bricks, or look out metal-clad oriel windows, framed within, not overcome by, their environs. Figure 2. Installation view of Ebony article on the Wall of Respect from 1967, Johnson Publishing Company, Inc. (left); and photographs by Bob Crawford, Darryl Cowherd, and Robert Abbott “Bobby” Sengstacke (right). Photograph courtesy of the author. The curators only briefly mention the controversy that contributed to the break-up of the Visual Arts Workshop.4 The Statesmen section by OBAC artist Norman Parish was painted over under Walker’s direction and repainted by Eugene “Eda” Wade, a young artist who was not a member of OBAC. Walker and Eda continued to repaint sections of the mural, inviting other artists unaffiliated with OBAC to contribute here and there, and then expanded the project across the street in 1969, naming it the Wall of Truth. Contrary to OBAC’s original conception, the later phases of the mural emphasized the struggles facing the community in scenes depicting the KKK and police violence, as well as calls to resist such forces. The change in subject matter is demonstrated by two large photomurals that bookend the exhibition in the first and third galleries. The first, a black-and-white photograph of the original OBAC Wall when it was completed in August 1967, faces another in full color that depicts the Wall in late 1967 after Walker and Eda repainted it for the third time. 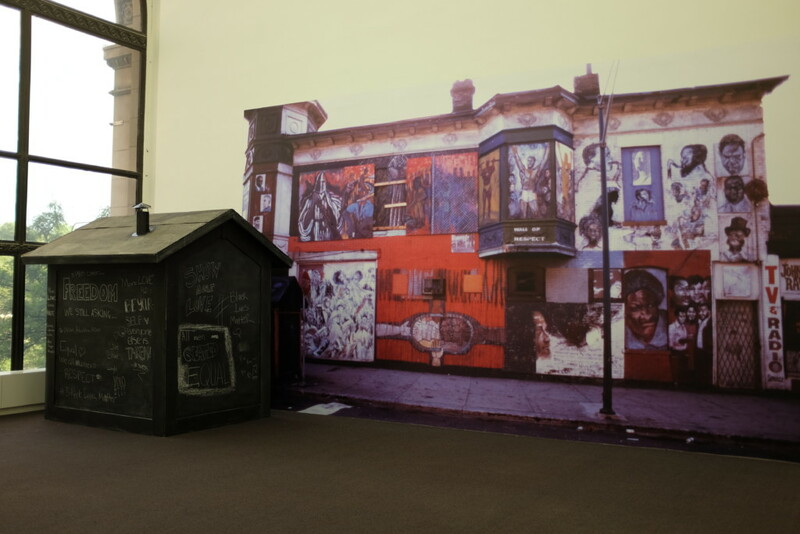 The distance between them in the gallery belies how short the time between these phases actually was—the Wall of Respect, at least as OBAC envisioned it, existed for less than a month before it was repainted and the workshop dissolved. Setting aside these changes, the final gallery refocuses on the OBAC themes of “respect” and “hero” by inviting viewers to contribute responses to the exhibition by asking questions such as “Who are the black heroes of today?” and “Who do you respect?” This gesture proposes that OBAC’s original aims—to uplift the community and inspire a positive image of blackness—are still relevant today. Yet it seems that the project was more complex than these questions suggest. We might also ask: what counts as the Wall of Respect, the original version by the OBAC artists or the later phases led by Walker and Eda, or both? To whom does this history belong? The dispute is still fresh, as evidenced by the exchange among several of the living artists who convened at the roundtable on the opening day of the exhibition, and each artist holds a claim to their version. While it is notable that the exhibition does not explore these questions more fully by considering the mural’s later phases and contributors, the decision to focus on its success as a symbol of black pride is understandable. Consensus and solidarity are not the same, and the dispute threatens to overshadow the fact that the Wall was not only a collective artistic production, it was the locus and expression of a community identity. The difficulty of representing complex and contested histories is that they resist resolution, and the curators do not seek to impose it. Despite the less-than–complete narrative, this exhibition demonstrates that presenting community-based public projects through multiple interpretative layers can illuminate Chicago’s diverse histories of social practice. Upstairs in the ornate Sydney R. Yates Gallery of the Chicago Cultural Center, Eugene Eda’s Doors for Malcolm X College is a productive visual and conceptual companion to the archival Wall of Respect exhibition. When the college moved into a new building in 1971, Rosa Moore, the campus projects coordinator, brought Eda in as an artist-in-residence to paint the doors in the four stairwells of the building. The college, which serves a primarily black student body, had been recently renamed for Malcolm X with the support of the surrounding community, reflecting its growing interest in Black Power politics. Eda’s mural program, which merges Black Power and Afrocentric imagery, was intended as a visual analogue to the college goal to “help our children and people rediscover their identity and thereby increase self-respect.”5 The murals were removed before the building was demolished in 2016 as part of the controversial “reinvention” plan for the seven City Colleges of Chicago. Figure 3. 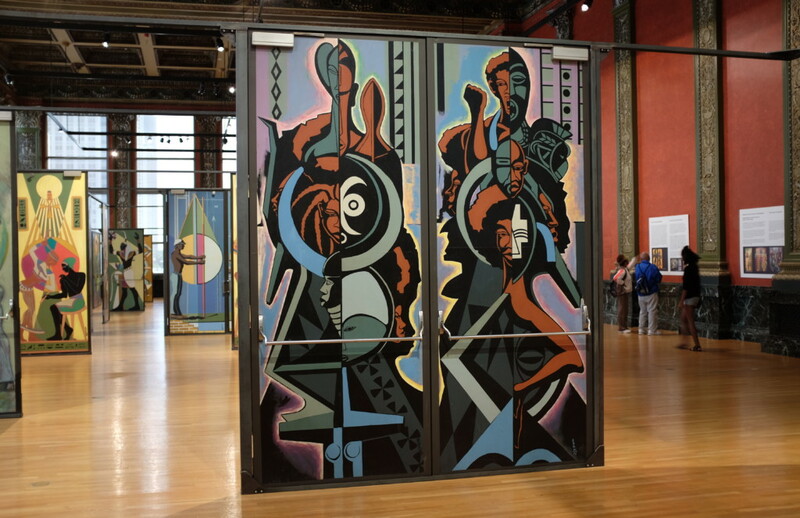 Installation view of Eugene Eda’s Doors for Malcolm X College at the Chicago Cultural Center. Photograph courtesy of the author. In contrast to the Wall of Respect, where OBAC’s goals explicitly framed the straightforward subject matter, Eda’s murals are more iconographically and stylistically layered. In their original context, the mural program was organized thematically by stairwell: the imagery in Stairwells A and B is inspired by African history and culture (ancient Egypt and West Africa, respectively), and Stairwells C and D present the struggles and achievements of black America in painterly and abstract styles. In the gallery, the sixteen sets of doors are installed in groups of four, facing one another in a square pavilion. The door sets are alternately installed as open or closed in each pavilion (fig. 3). Since the exhibition arranges the pavilions by floor, doors from each stairwell stand together, heightening the surprising diversity in their styles. The juxtaposition also creates a comparison that reveals Eda’s inventive compositional solution to working within such a challenging format (each door is ten feet high and only four feet wide). He arranges stacks of figures and geometric forms within the elongated format, utilizing strong diagonals to balance and animate what would otherwise be a tediously redundant format. And indeed, each set of doors seems like a new and refreshing visual proposition. Detached from their architectural context, the doors seem more like monumental paintings. With the exception of the basement level, Eda painted the same composition on both sides of each door, so they could be viewed whether opened or closed. Moving around the doors in the gallery, the viewer may notice the subtle shift in the composition of the diptych that would occur when the doors open and close—for instance, figures that face one another when the doors are closed turn away as they open. This points to the ways that the functionality of the doors was less an impediment to invention than it was an opportunity. Figure 4. Eugene “Eda” Wade, mural doors from first floor Stairwell C. Photograph courtesy of the author. Though the didactics provide an overview of Eda’s African sources, addressing the meaning and reception of African imagery in the mural doors, and the Black Arts Movement more broadly, would do more to illuminate the significance of the murals. Indeed, Eda’s references to African imagery reflect careful study and historical recitation instead of any longing for an African imaginary. Throughout the program, Eda traces a continuum of learning and accomplishment from Africa to America and, in so doing, proposes an Afro-diasporic visual aesthetic unbroken by the transatlantic slave trade. This is most clearly synthesized in a mural from the first floor in Stairwell C, in which he composes a figure from African statuary (an Asante Akua Ba figure, the head of an Oba from Benin, and a Senufo mask, among others) and black figures posed as emblems of pride and resistance (full afros, mouths crying out, and raised fists) (fig. 4). The composite figure shifts along a central axis between patterned and figurative forms. At its most basic, the oscillation within the work between disparate styles gestures toward a reconciling of the tired debate between figuration and abstraction, yet the iconographic play suggests a more provocative relation between past and present, and Africa and America. In his recombinant gesture, Eda pictures black American revolutionary consciousness as part of an international anti-colonial struggle in which the maintenance of culture cannot be set aside in favor of more expedient politics. Despite their official sanctioning in the halls of civic pride, the radical propositions that these mural projects offer—about community, identity, and resistance—are just beginning to be researched and exhibited. As these exhibitions demonstrate, the challenge to preserve and document such projects is imbedded in the city’s historic processes of uneven development, which sanction some histories while erasing others. 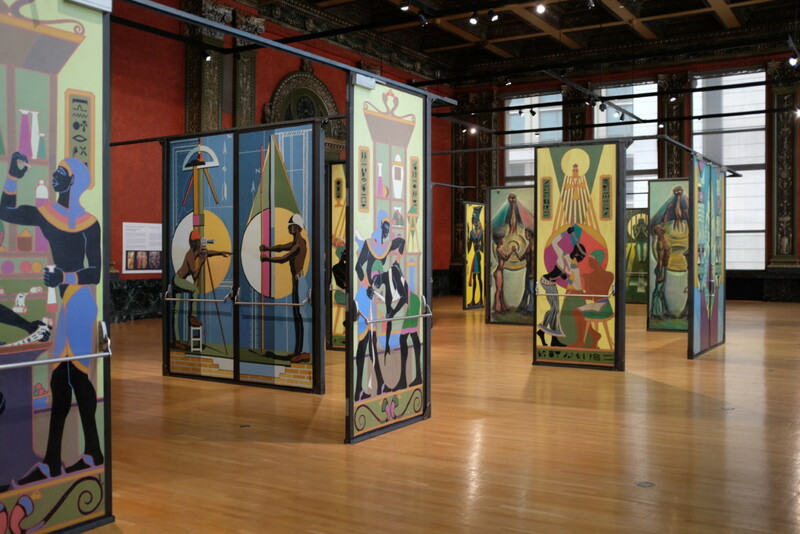 That the exhibitions are at the Chicago Cultural Center instead of at one of the city’s more prominent art museums speaks to the tenuous place that some of Chicago’s most important black artists have in the history of the city and ­in twentieth-century art more broadly. 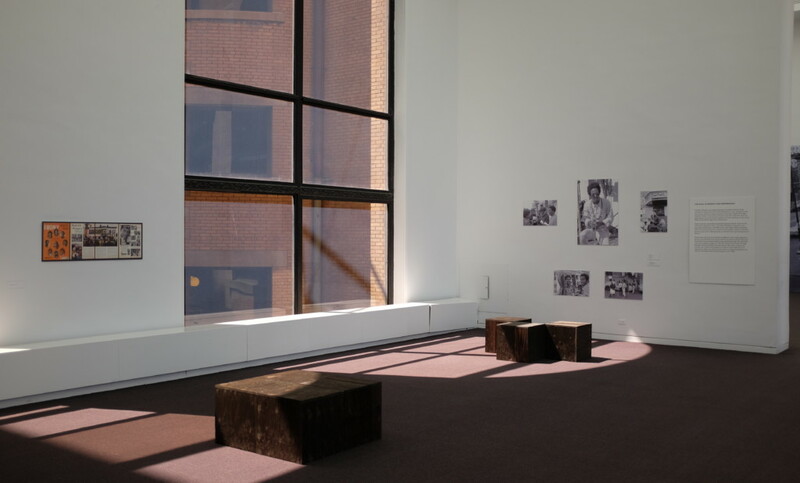 Cite this article: Marissa H. Baker, review of The Wall of Respect: Vestiges, Shards and the Legacy of Black Power and Eugene Eda’s Doors for Malcolm X College, Chicago Cultural Center, Panorama: Journal of the Association of Historians of American Art 3, no. 2 (Fall 2017), https://doi.org/10.24926/24716839.1624. About the Author(s): Marissa H. Baker is a doctoral candidate at the University of Illinois at Chicago. What Is the Role of Patriotism in the Study of American Art?